Wesley Vance Claybourn (“Vance”) was born on 30 July 1898, in Kinmundy, Illinois to Reuben and Mary Ann Claybourn. He moved to Mt. Vernon, Illinois, when he was about nine years old and there he attended Franklin School, graduating in 1913. Vance attended high school for a while but did not graduate because he learned telegraphy and went to work as manager of Western Union in Pekin, Illinois. While in Pekin, he met Virona Maude Champion (“Vi”) and the two were married there on 2 December 1916. [Vi Champion was born on 4 July 1897 at Green Valley, Illinois to Andrew Champion and Virona Berry.] 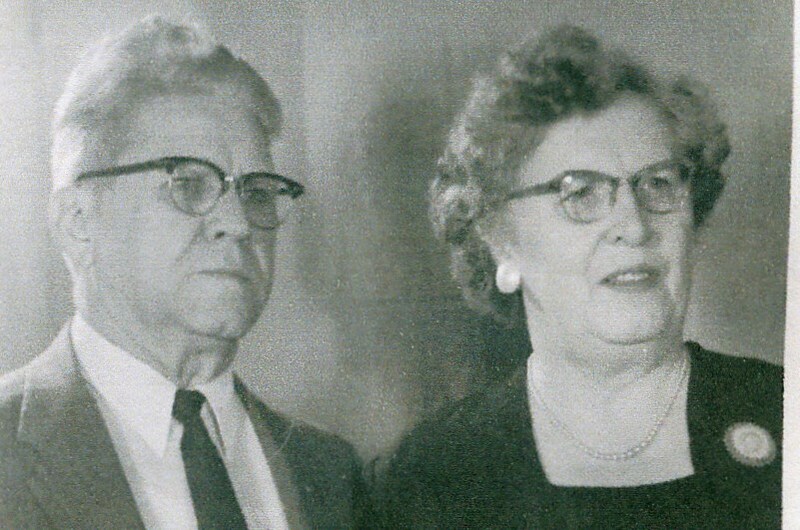 Vance and Vi lived for a while at Sherman, Texas, and were in Joplin, Missouri during World War II. Later, during much of the 1960s, they lived in Fort Scott, Kansas. Vance worked as Relay Telegrapher for the Atchison, Topeka, and Santa Fe Railroad from 1916 to January of 1921, and thereafter he worked for the St. Louis – San Francisco (“Frisco”) Railway as Agent, Wire Chief, Train Dispatcher, and Chief Dispatcher. “Vi” and Vance were both very civic minded and community spirited. Vance was a member of the Order of Railroad Telegraphers, American Federation of Labor, Association of American Train Dispatchers (including as Secretary-Treasurer and General Chairman), Fort Scott Rotary Club, Masonic Lodge (1952), and Scottish Rite (1953), District Chairman of the Boy Scouts of America (1953), Chairman of the Bourbon County Blood for Red Cross (1958-1959), Bourbon County Agricultural Committee, Chairman of the Four H Council (1958), and Vice Chairman of the Springfield Region Area American Red Cross (1959). Vi was equaly involved in her community. She was President of the PTA Council in Sherman, Texas (1930); President of the PTA at Crockett School (1931) and Jefferson School (1938), both in Sherman; Chairman of the Red Cross Gray Ladies in Camp Crowder, Missouri (1944-1948); Presient of the American War Dad’s Auxiliary in Joplin, Missouri (1945); President of the Tri-State Rose Society (1947); Director of the League of Women Voters in Joplin (1948); President of the Order of Eastern Star Study Club in Fort Scott (1953); Secretary of the Federated Women’s Clubs (1953); President of the Rotary Anns (1954); and Vice-President of the Pierian Club in Fort Scott (1958). She was also active in the Presbyterian Church and enjoyed cut work and bridge as hobbies. Vi and Vance were proud of their family – all four of their children were college graduates. Vance died on 27 July 1979 in Fort Scott, Bourbon County, Kansas. Vi followed in death many years later on 28 December 1989, also in Fort Scott, Bourbon County, Kansas. Jack Junior Claybourn was born on 15 June 1917 in Wellington, Kansas. He earned a bachelor of arts degree at Austin College in Sherman, Texas and then enlisted in the military on 13 November 1941 at Fort Levenworth, Kansas. The following year (1942) he entered Officer’s Candidate School and would go on to earn the rank of 2nd Lieutenant (1942), Captain (1945) and Major (1957). Jack married on 10 October 1942 in New York City to Helen Mae Wallen just after he had enlisted in the military. [Helen Wallen was born on 14 July 1920 in Bourbon County, Kansas.] Together they had three children, listed below. Jack served overseas on the Accra Gold Coast in Africa, and then in Ghana on January of 1943. Later that fall in September of 1943 he was assigned as Personnel Officer at La Guardia Field in New York. Jack was in the inactive service beginning on 12 January 1946 but was reactivated to Military Air Transport at Casa Blanca in June of 1951. He returned in September of 1953 and served as Personnel Officer at McConnell Air Force Base in Wichita, Kansas. In 1957, however, he was the traffic representative of Navajo Truck Lines in Wichita, living in Derby, Kansas. Jack Junior died on 5 June 1983 of emphysema at the V.A. Hospital in Dallas. Thereafter his widow Helen lived in Kansas City, Missouri, where she died on 10 October 1995. Jack and Helen are buried together in Resurrection Catholic Cemetery in Johnson County, Kansas. Janet Lee Claybourn was born on 13 May 1948 in Wichita, Kansas, and married Larry Montgomery. The two lived in Denver, Colorado and later in Rapid City, South Dakota. Janet later married Dusty Johnson. Carla Marie Claybourn was born on 5 January 1950 in Wichita, Kansas. She married Craig Arthur Prascher on 5 June 1971 in Pennington County, South Dakota. [Craig Prasher was born on 03 October 1948.]. They had two children, listed below, and lived in Plano, Texas. Christopher Andrew Prasher was born on 14 September 1976. He married Sara Alavi Faradineh on 16 July 2005 in Collin County, Texas. Scott Warren Prasher was born on 15 November 1979. Charles Vance Claybourn was born on 3 January 1952 in Casa Blanca, French Morocco. [Joshua A. Claybourn corresponded in with Charles beginning in 2007.] He married Joan Frances Schmid on 10 February 1973 in Pennington County, South Dakota. They had four children, listed below. Charles worked as a minister with the United Methodist Church. Jarod John Claybourn was born on 11 October 1979. He played football at Paulsboro High School in New Jersey and at King’s College in Wilkes-Barre. [Carchidi, Sam. “Claybourn named Sterling grid coach.” Philadelphia Inquirer April 2007.] He starred at defensive back and divided quarterback at Paulsboro, helping the school set a state record for consecutive wins. At King’s, he was a MAC academic all-star in 1999 as a quarterback and in 2001 as a wide receiver. Following college he was an assistant football coach at Sterling High School for five seasons before assuming the head coaching responsibilities in 2007 until stepping down in 2010. Later he served as vice-principal at Somerdale School District in Camden County, New Jersey, and worked as an anti-bullying specialist. Jarod married Mary Michelle Dougherty. Caitlyn Theresa Claybourn was born on 23 April 2011. James Parker Claybourn was born on February 27, 2013. Brieanne Bray Claybourn was born on 04 September 1981. She married Stephen Boyd Thompson and had two children, listed below. Josiah Charles Thompson was born on 05 November 2007. Thatcher Stephen Thompson was born on 24 August 2010. Victoria (“Tori”) Dawn Claybourn was born on 29 August 1985. She married Robert Joubert. Andrew Jack Claybourn was born on 01 June 1986. He married Jessica Ann Peacock. Audrey Faith Claybourn was born on 14 March 2008. Lucas Aaron Claybourn was born on 03 February 2011. Logan Asher Claybourn was born on 16 June 2014. Jack Abram Claybourn was born on 1 March 2016. Norman Leigh Claybourn, M.D. was born on 12 April 1920 in Pekin, Illinois. He earned a bachelor of arts degree from Austin College in Sherman, Texas. 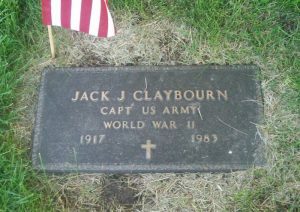 Thereafter he entered the military service reserve as a 2nd Lieutenant in May of 1942 and later served as 1st Lieutenant. Two years later he earned an M.D. from the Kansas University School of Medicine (31 January 1944) and interned at the City Hospital in Akron, Ohio (1944). Norman was also on the active duty Medical Corps (1944) and achieved the rank of Captain on 16 August 1945. He served on the Hospital Ship “Charles A. Stafford” in the Atlantic and Pacific area and left the military on 13 December 1946. Norman married Louise Virginia Luffel on 4 July 1942 in Fort Scott, Kansas. [Louise Luffel was born on 24 October 1920.] He and Louise had three children, listed below. During a 40-year medical career, Dr. Claybourn worked in Missouri, Texas, Kansas, Indiana, and Illinois. He had worked as the Granite City Steel Company doctor and as an emergency room physician at St. Elizabeth’s Hospital in Granite City. Later, he opened a private practice in Granite City. He retired at age 70. Dr. Claybourn was a member of the Shriners, the St. Charles Wood Carving Club, and the Masonic Lodge. Norman died on 2 November 2005 of diabetic complications at Blanchette Place in St. Charles and is buried in Jefferson Barracks National Cemetery in St. Louis. 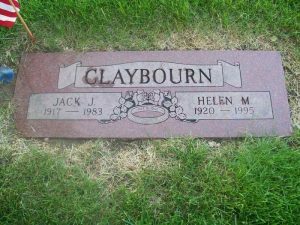 Judith Louise Claybourn was born on 14 July 1944 in Akron, Ohio. She married Brian Keck. [Brian Keck was born on 07 Dec 1944.] They lived in Garland, Texas and had two children, listed below. Jason Barrett Keck was born on 21 January 1970. He married Jennifer Lynn Gervers on 25 May 1996 in Collin County, Texas. Alicia Paige Keck was born on 19 November 1971. She married James L. Thornton on 3 April 1999 in Bexar County, Texas. Carol Anne Claybourn was born on 23 October 1946 in Fort Scott, Kansas, and attended Indiana University in Bloomington. Sh married (1st) Steve Braughton. Later she married (2nd) David Baer and lived in St. Charles. [David Baer was born on 22 December 1940 in Hammond, Lake County, Indiana.] David Michael Baer was born 22 December 1940 in Hammond, Lake Co, IL, lived at some point in St. Charles, MO and died on 3 August 1995. Marilyn Sue Claybourn was born on 5 June 1949 in Fort Scott, Kansas, and married (1st) Fred Hawkins. She married (2nd) Joseph H. Dolan Jr. on 27 July 1972 and they divorced on 27 March 2001 in Tarrant County, Texas. [Joe Dolan was born on 23 March 1947.] Marilyn and Joe had two children, listed below. Marilyn and Sue then married again on 1 September 2005 in Tarrant County. Michael Dolan was born on 27 February 1976. William Dolan was born on 4 February 1977. Alvin received his bachelor of science degree from Iowa State College and a master’s degree from the University of Wisconsin. He served as 2nd Lieutenant in Field Artillery at Camp Dodge, Iowa (3 April 1943), was instructor in Field Artillery until January of 1945, was a Liaison Pilot at Sheppar Field in Texas (April 1945), and was 1st Lieutenant on 7 December 1945. Alvin separated from the military service on 11 April 1945. Thereafter he was a county agricultural agent and a regional supervisor over several counties for the U.S. Department of Agriculture. In 1959 he joined Iowa State College as an Associate Professor. Alvin died on 20 April 1996 in Waterloo, Iowa and is buried in Greenwood Cemetery in Cedar Falls, Iowa. Theodora Ann Goettsch (“Toi Ann”) was born on 10 October 1944 in Joplin, Missouri. She married Robert A. Christenson (“Bob”) and together they had two children, listed below. [Bob Christenson was born on 5 November.] Bob graduated from law school and became an attorney. Dirk Christensen was born on 25 October 1965. Erik Christensen was born on 04 November 1969. Taryn Valenta was born on 09 April 1982. Bryce Valenta was born on 12 February 1988. Billy James Claybourn was born on 8 September 1926, in Dublin, Texas. [Information on Billy and his dscendants is largely based on personal correspondence between Billy and Joshua A. Claybourn in 2009.] 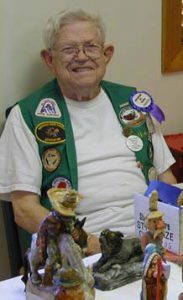 He graduated from high school in Fort Scott, Kansas, and served as a pre-aviation cadet from February to November of 1945. He earned a bachelor of science degree in chemical engineering at the University of Missouri in 1948 and would go on to work as Special Products Engineer for “ethylene,” which is used to make plastics. Later he would work as a process control engineer at the Field Research Laboratory for Magnolia Petroleum Company (later owned by Mobil Oil Company). The last portion of his career with Mobil Oil was spent in Dallas where he traveled extensively overseas on potential LNG (Liquefied Natural Gas) projects. Bill retired in 1990 after 42 years of service. Billy married (1st) on 25 September 1954 to Thelma Ruth Maples in Mission, Hidalgo County, Texas. [Thelma Maples was born on 2 April 1929 in Victoria, Texas.] She earned a bachelor of arts degree from the Texas College of Arts and Industries in 1950. Bill and Thelma had four children, listed below. Thelma died on 12 May 1998 in Irving, Dallas County, Texas and is buried in Oak Grove Memorial Gardens, Irving, Texas. Billy married (2nd) Della Joan Smith on 31 July 2001 in Irving, Dallas County, Texas. [Della Smith was born on 01 Dec 1930 in Tonkawa, Kay County, Oklahoma. ] Della was a graduate of Wichita State University with a degree in journalism in 1951. She retired in 1996 after an extensive career as a high school teacher of English and journalism. David Mark Claybourn was born on 10 May 1955 in Falfurrias, Texas. He graduated from Southwest Texas University with a degree in journalism and served as the sports editor of the Herald Banner in Greenville, Texas. Susan Diane Claybourn was born on 17 May 1956 in Alice, Texas. She married Bob Craig on 24 November 1979 in Greenville, Hunt County, Texas, but the coulple primarily lived in Nashville, Illinois. [Bob Craig was born on 24 March 1957.] Both Bob and Susan graduated from Texas Tech University. The couple first lived in Naperville, Illinois and relocated to Arlington, Texas. They had two children together, listed below. Bob worked for Owens Corning and Susan worked for a rebar company in Dallas. Laura Craig was born on 08 November 1985. On 09 August 2008 she married Christopher Weaver in Fort Worth, Tarrant County, Texas. [Christopher Weaver was born in about 1985.] Laura and Chris both graduated from Texas A & M University. Christ later attended law school and Laura attended medical school in Fort Worth. Stephen Craig was born on 15 November 1988. He attended Grinell University in Iowa and studied Chinese. Cynthia Sheryl Claybourn was born on 24 June 1958 in Dallas, Texas. On 20 December 1980 she married Paul Walker in Fort Worth, Texas. [Paul Walker was born on 25 March 1956 in Shreveport, Louisiana.] The two lived just outside of Weatherford, Texas and had two children, listed below. Paul worked for General Dynamics in Fort Worth and Cynthia taught school at Brock, Texas. Emily Walker was born on 14 June 1984. Jared Walker was born on 30 June 1987. Melanie Ann Claybourn was born 25 July 1962 in Falfurrias, Texas. Melanie graduated from Texas Tech University in December of 1984 and later worked as a counselor in the Fort Worth school system. She married (1st) on 18 October 1997 in Parker County, Texas, to Joe M. Hanna and they divorced there on 29 April 1999. She married (2nd) on 11 April 2009 in Tarrant County, Texas, to Thomas L. Tanner.